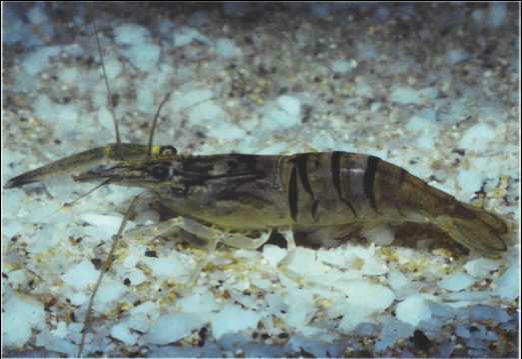 This family includes the familiar pink shrimp, as well as a large number of freshwater tropical species, such as the genus Macrobrachium (which covers some 200 species). These longpincer shrimps are sometimes raised for restaurants: this is the case with M. rosenbergii, which grows to 25 cm, without counting its pincers. It is the smaller species that are sold in the aquarium trade, with M. lanchasteri being the most common at the moment. Native to South-East Asia, it acts as a garbage collector in a tank by eating the particles left behind by the fish. This shrimp likes filtered light and shelters for taking refuge if it is disturbed. When it is really frightened, it can jump out of the water to escape from danger. It is prone to attack the fish fry, which it easily detects with its acute sense of smell. Size: 7-8 cm. КАРАГАНДИНСКАЯ ОБЛАСТЬ , в Казахстане. 117,9 тыс. км2. Население 1340 тыс. человек (1991). Административный центр - Караганда.